Microwave Chivda with Oats and Papad ! Are you taking a car trip this Memorial Day weekend? Do you pack snacks in the car that are “for the kids”? Then you are like me! This 6 minute microwave chivda, which I call my microwave POP chivda, is one snack I will not leave home without 😉 It is crispy, savory and a much lighter and healthier version of readymade chivda available in the stores. 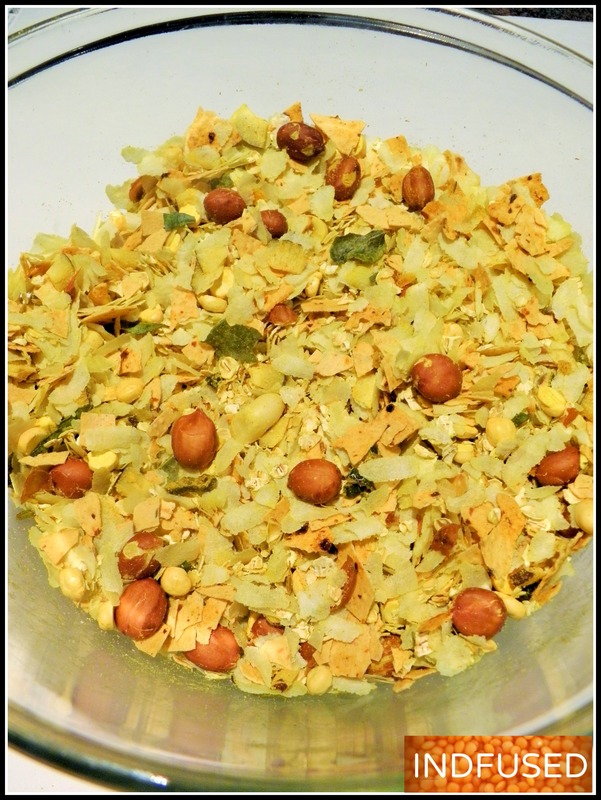 Also chivda available in the stores is generally made of deep fried or roasted poha. 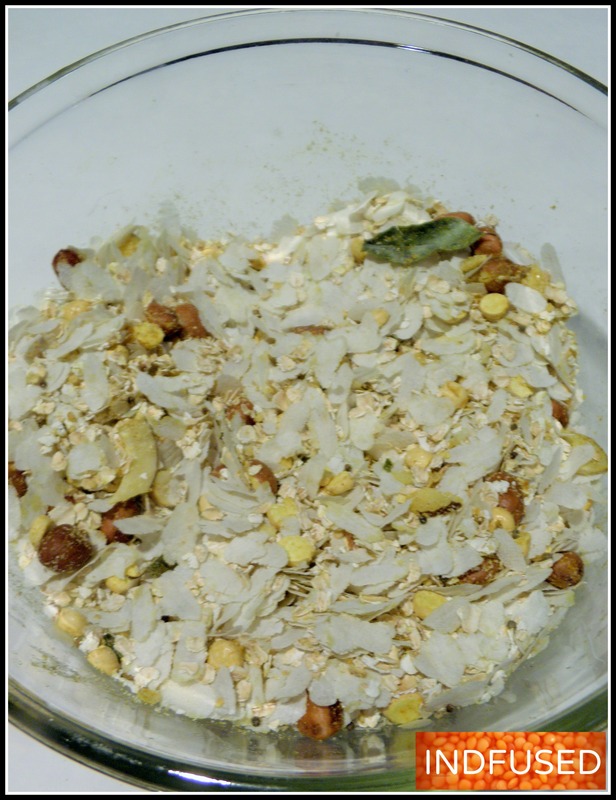 I add the oats and papad in my recipe which add nutrition and varied textures to the chivda. The POP stands for Poha, Oats and Papad. 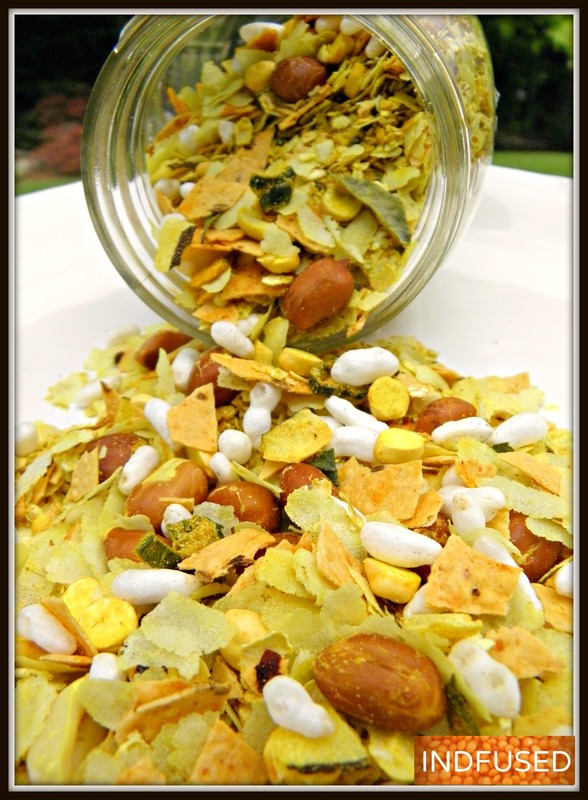 This yummy snack mix has iron rich poha, which is flattened rice, nutritious oats and papad made out of lentils. 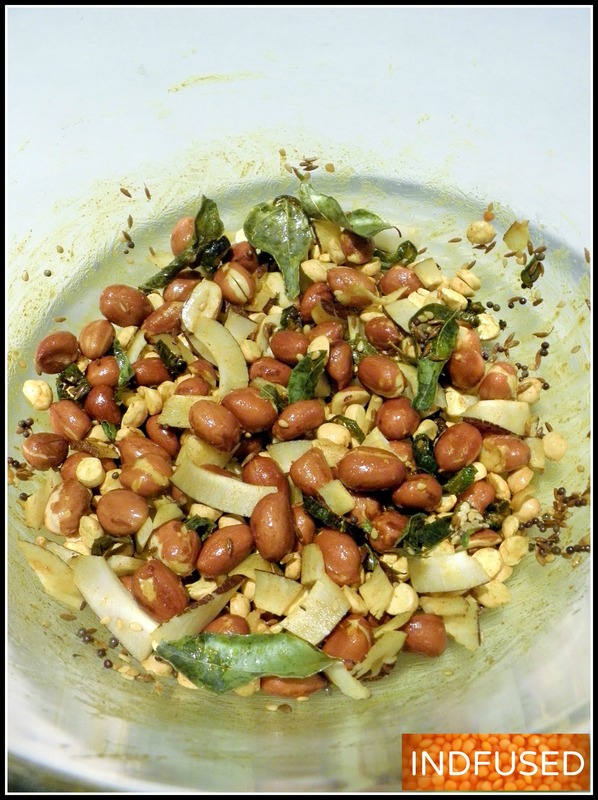 Peanuts and roasted chana dal also add to the protein content of this chivda. And did I mention addictive? Well, there have been some car trips when I noticed that we have eaten most of the chivda…..and I look out the window to realize we have driven only a few milesJ Just today, when I took the pictures for this post it was not very sunny outside. 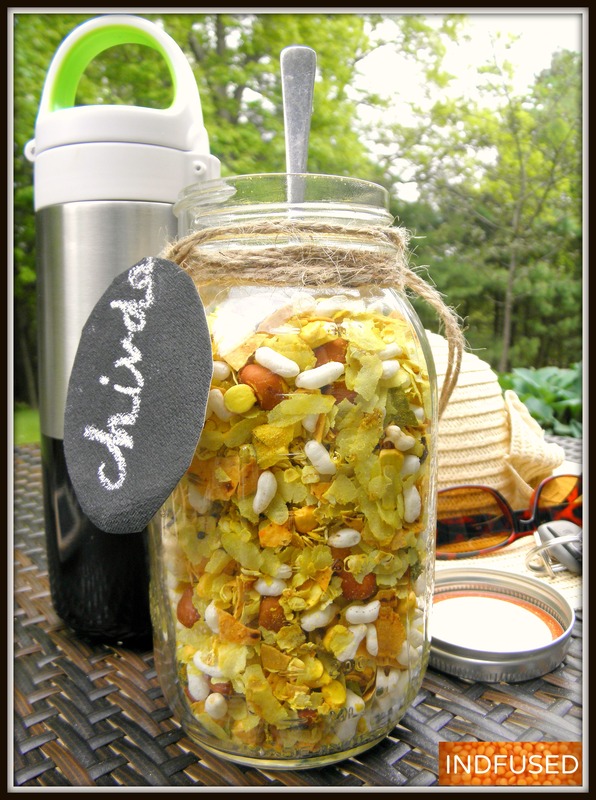 Later when I saw that the sun had come out from behind the clouds, I rushed to take pictures….only to notice (embarrassingly) that the quantity of chivda in the jar had diminished considerably….so….. not so sunny pictures it is….but I have a happy tummy! 4 papads, about 8 inch in diameter, roasted, cooled and crushed into tiny pieces. I used Ganesh brand chana masala garlic papad. I break them in half and microwave 4 papad halves for one minute on high. 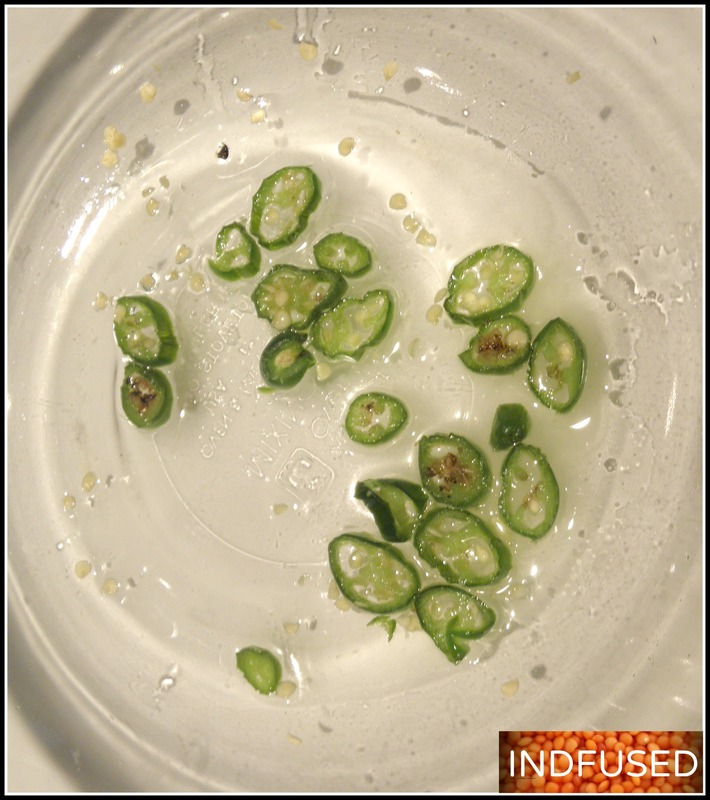 In a microwave safe bowl, add the oil and the green chili pepper. Microwave on high for 1 ½ minute. 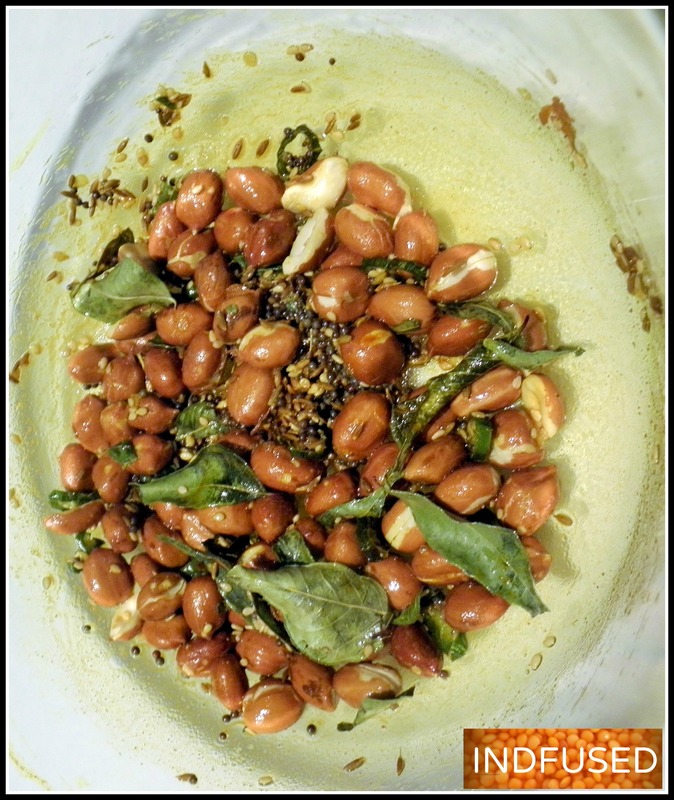 Add the curry leaves, cumin seeds, mustard seeds, asafetida, turmeric powder, sesame seeds and peanuts and microwave for an additional minute. Remove bowl, stir and microwave again for another minute. Add the oats, thin poha, sea salt, sugar and amchur powder, toss well and microwave for one minute. Stir and microwave for another minute. Total microwave time =6 minutes. 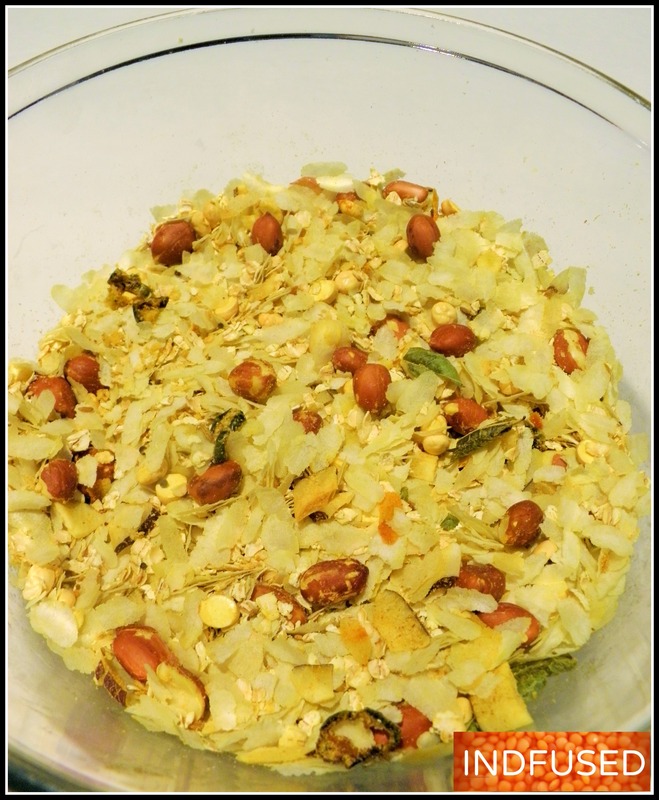 Remove the mix from the microwave, add the crushed papad and the puffed rice (if using). Let the chivda cool before storing. Papad has salt in it. So adjust the salt in the chivda accordingly. Adding the crispy rice or kurmure adds another layer in the texture of the chivda. Hope you relish the chivda as much as I do. Enjoy the car ride! Cheers! Here’s to Summer with Mirchina! Love me some chevda – what a great idea to add bits of papad in the mix, I’ll bet that gave it a good kick! :). I had to laugh reading your last bit Sandhya, it IS pretty addictive. It’s great that you created your own version, I know that the store bought kind is laden with sodium. I love chivda…especially the one that my mom makes. This is a nice twist to the traditional chivda. I should definitely give it a try. Yes do try it and let me know how you like it! Depends on which oats you have and how thick they are.The quick cooking oats are thin and cook really fast. Depends on which oats you have. The thick steel cut oats may not cook in the same amount of time. I feel the thin oats blend in better with the poha and cook fast. Hope that helps! It depends on which oats you have. the steel cut thicker ones may not cook as fast and blend in as the thin quick cooking ones do. Hope that helps! Let me know how your chivda turned out. I am addicted to chivda:) With this recipe, I make it all the time. I know….the typical faral items, right? I love chevda! I like the addition of papad. Thanks Greg. I feel papad add an additional crunch and up the protein content of the chivda too. Wow what a healthy snack time treat. Love the combo of poha and papad to add a bit of crunch. Microwave chivra looks crispy crunchy and delicious. Loved you made it with less oil. Superb share.